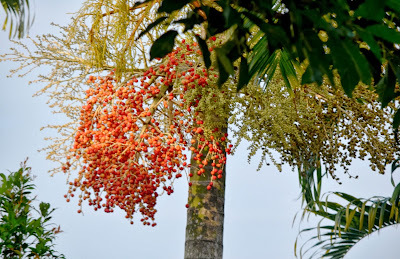 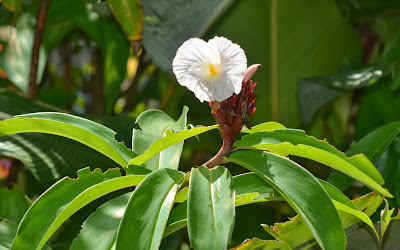 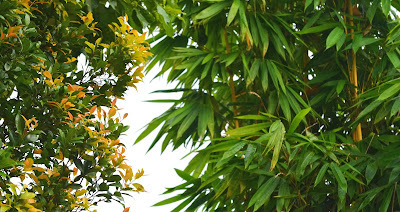 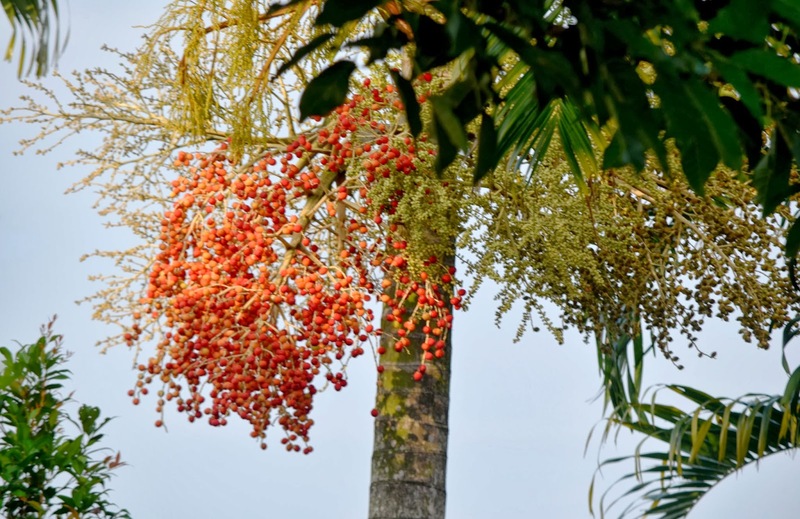 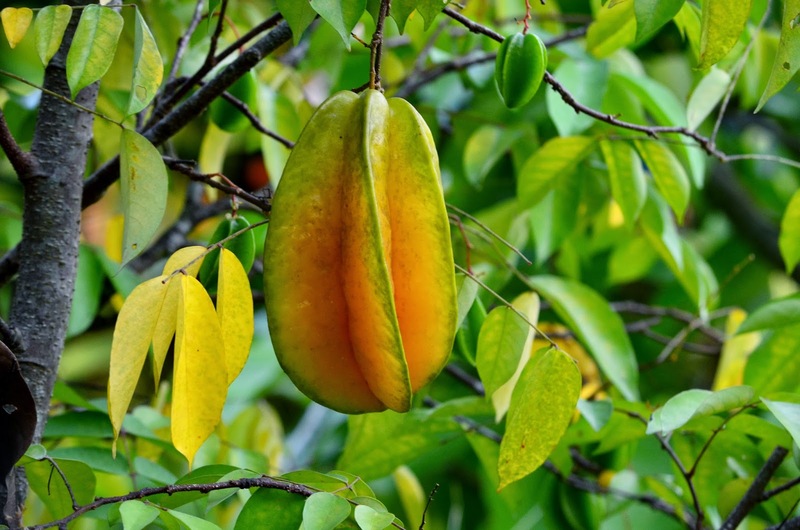 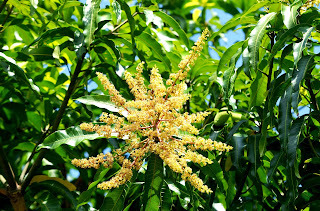 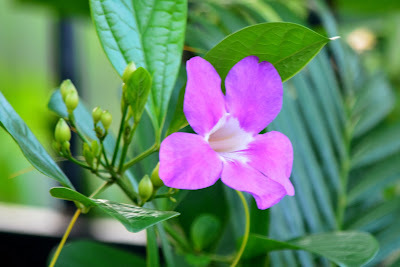 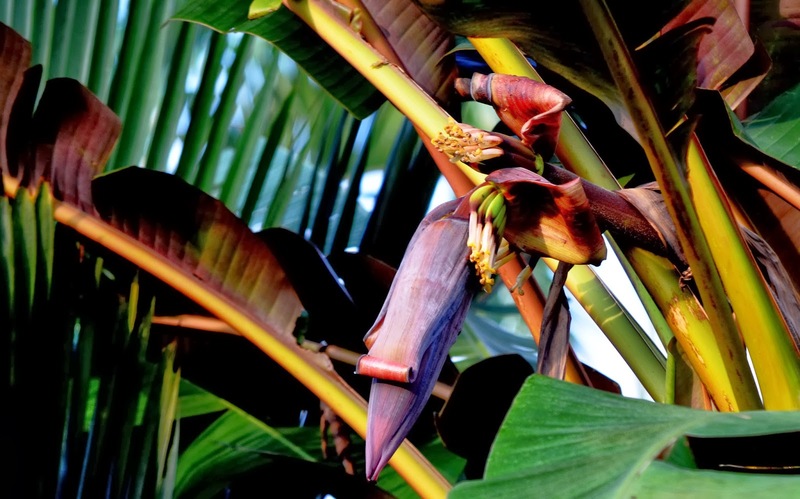 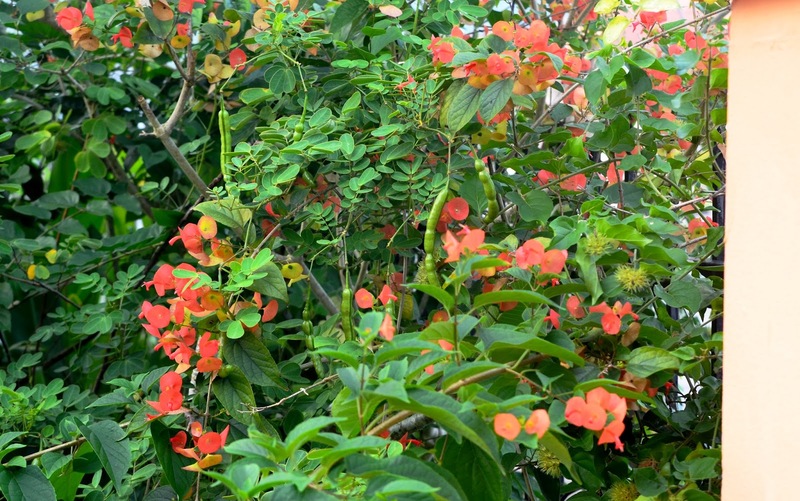 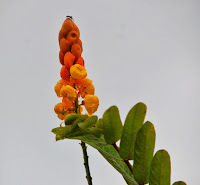 The Malays call the tree as "Terap" and the Bintulu Melanaus call it "Lumok". 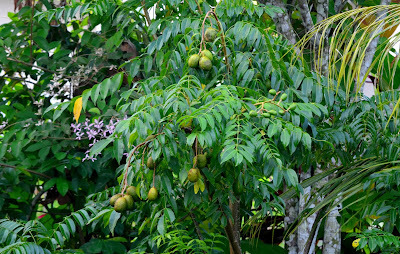 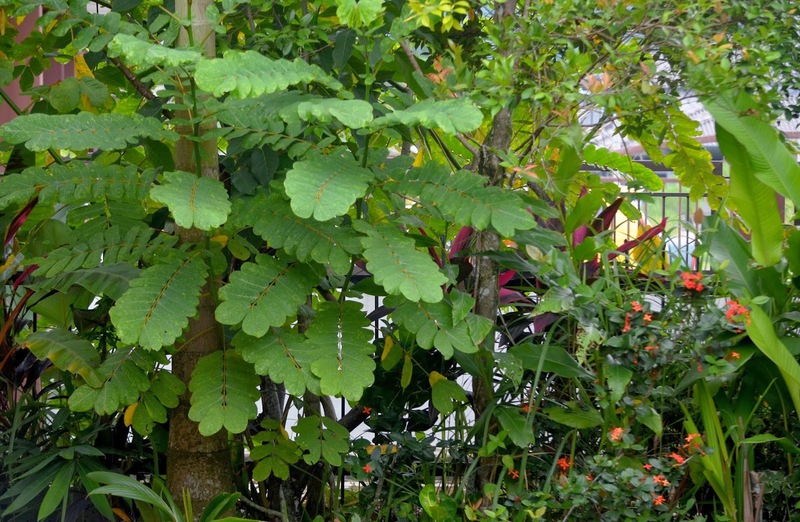 the Lumok tree is planted at the side garden facing south. It has grown to about 7 meters now. 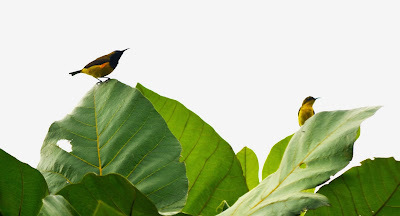 The Olive-backed sunbird couple is seen resting and perching on its broad leaves often to have a commanding view of their nest. I noticed this whole week that the nesting pair is very frequently seen around the nest area. The female flies very regularly to visit and then hide in the nest. 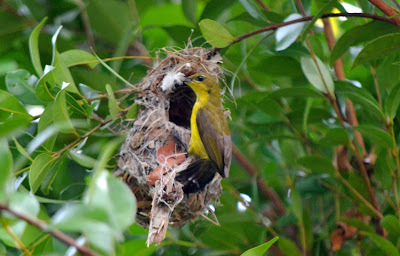 It would appear to me that she could have laid eggs already. 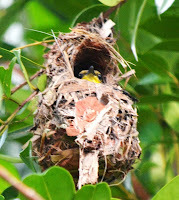 Unfortunately I would not have time to see them hatch because tomorrow we'll be on the way back to Bintulu. 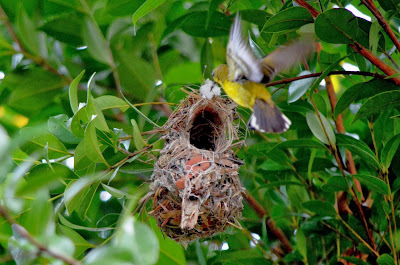 Whatever it is this visit has been most memorable for the chance it has given us to witness the pair building their nest and then making use of it for its intended puropose i.e. 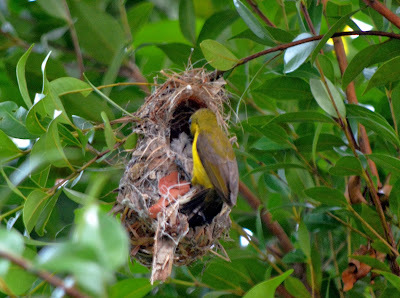 to lay eggs. I wish more chicks will be borne in our garden in future. Besides a nesting pair of Olive-backed sunbird, the other birds that are dropping by at regular basis at the garden are the Perling or Asian Glossy Starling and the Pipit. 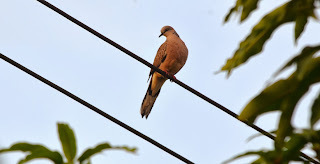 Here are some pictures of the birds seen within the last two weeks. 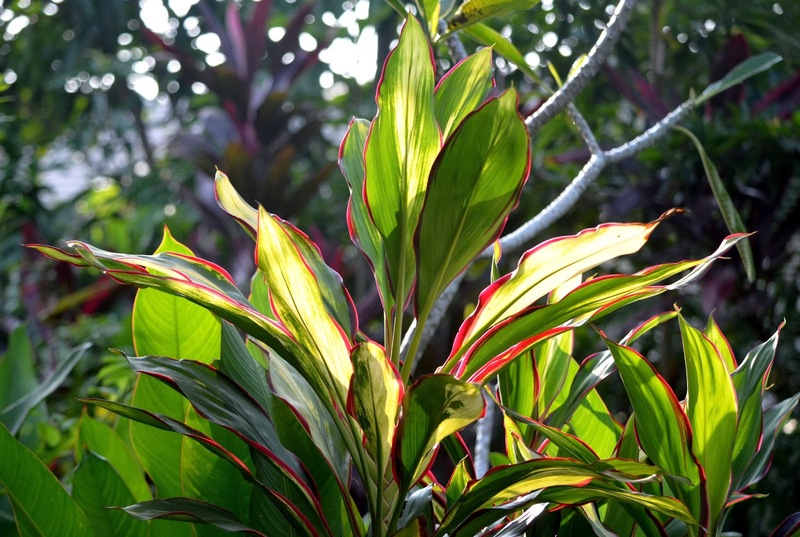 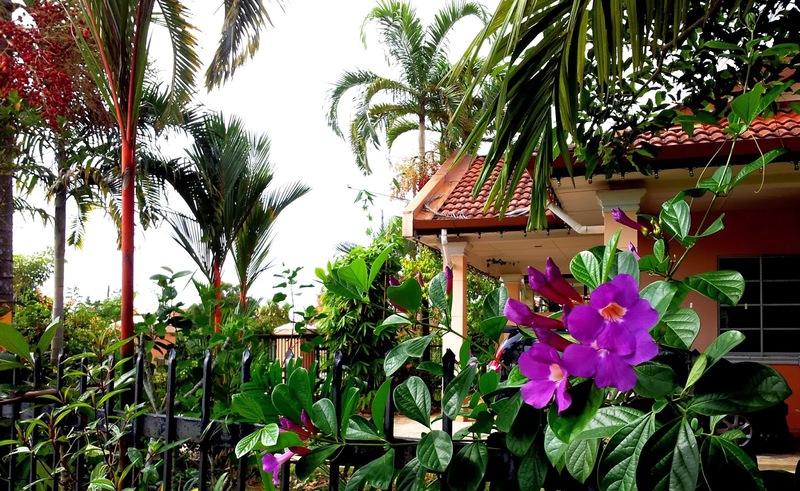 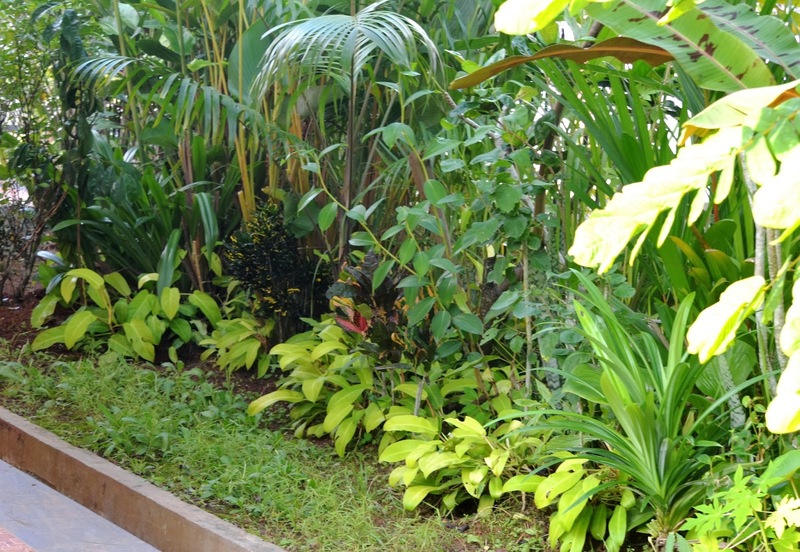 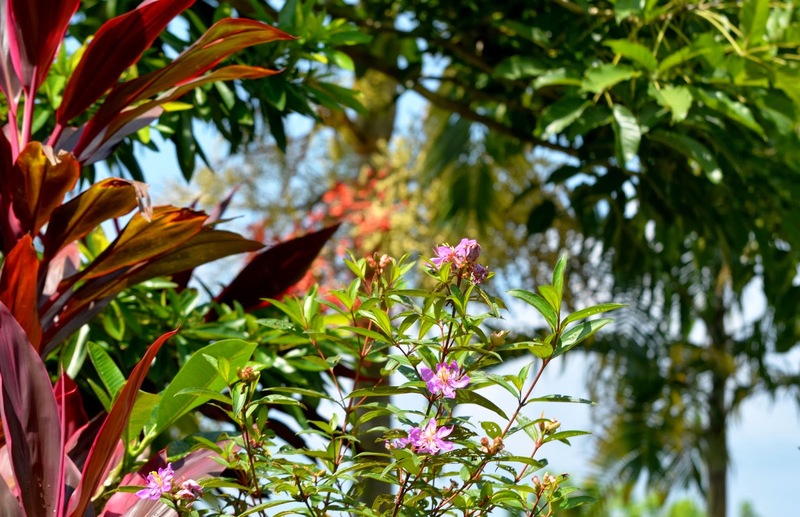 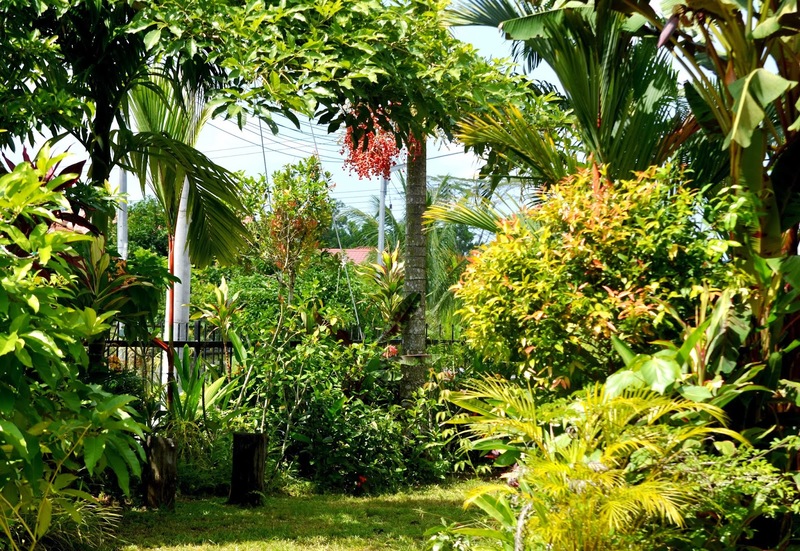 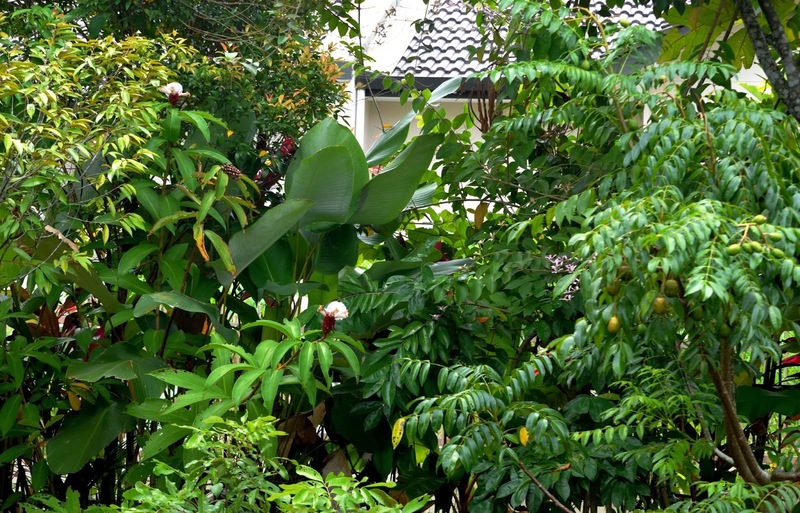 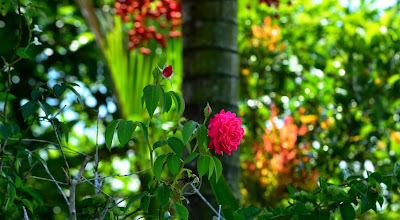 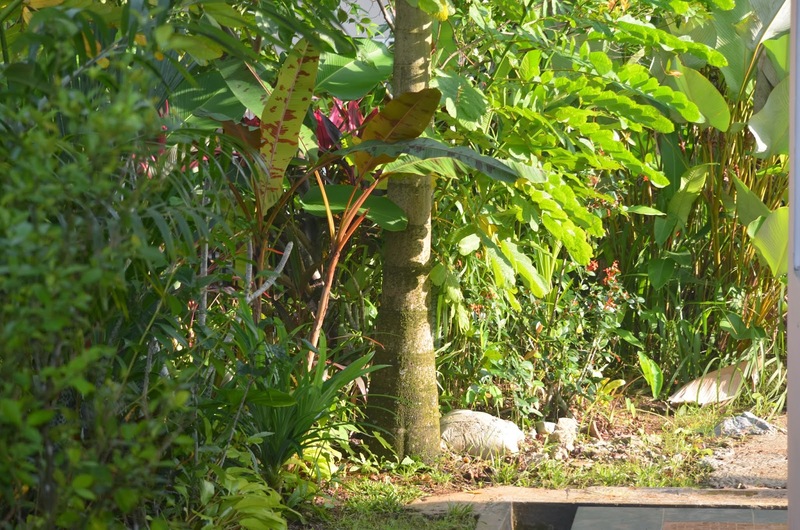 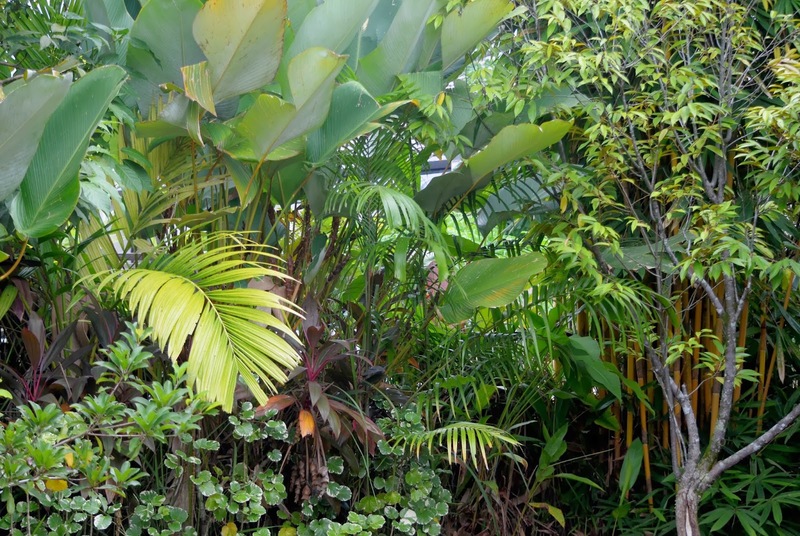 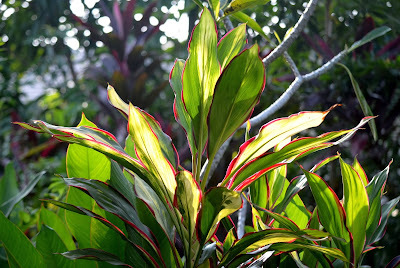 The Laman Kambatik (Malay) or Kambatik garden is providing much shade, greenery and colours now. 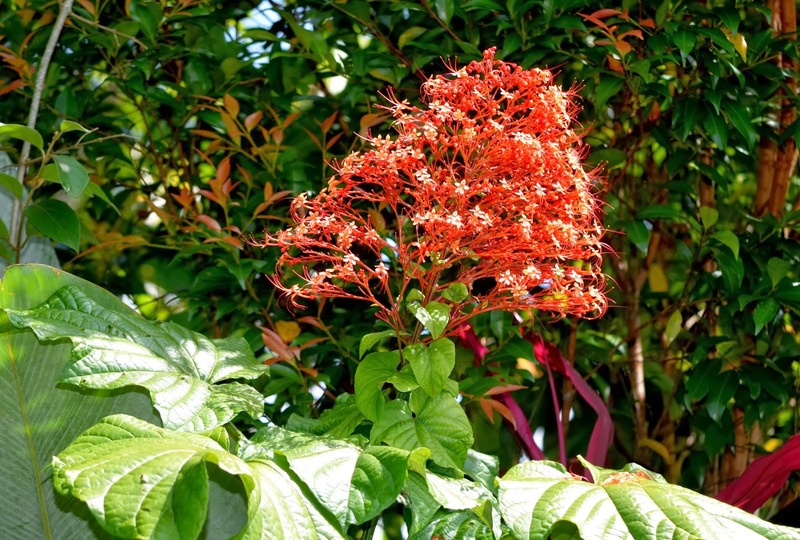 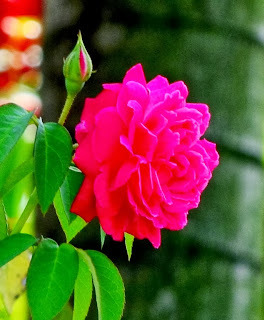 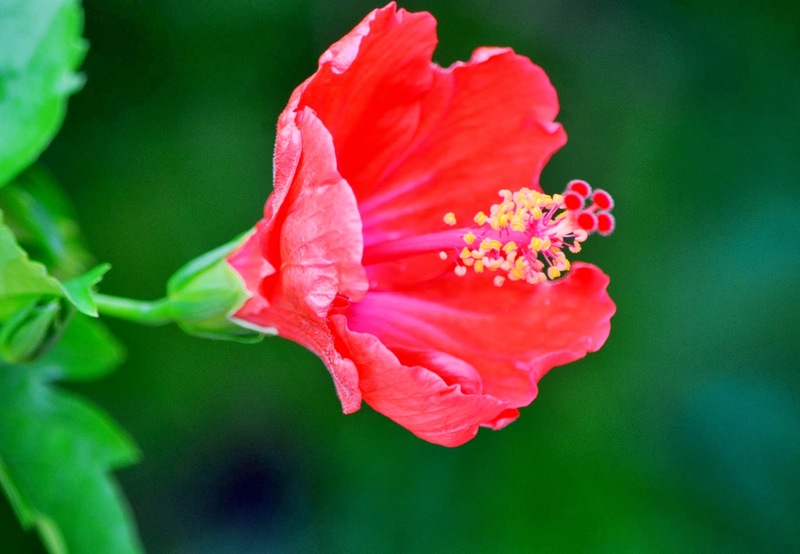 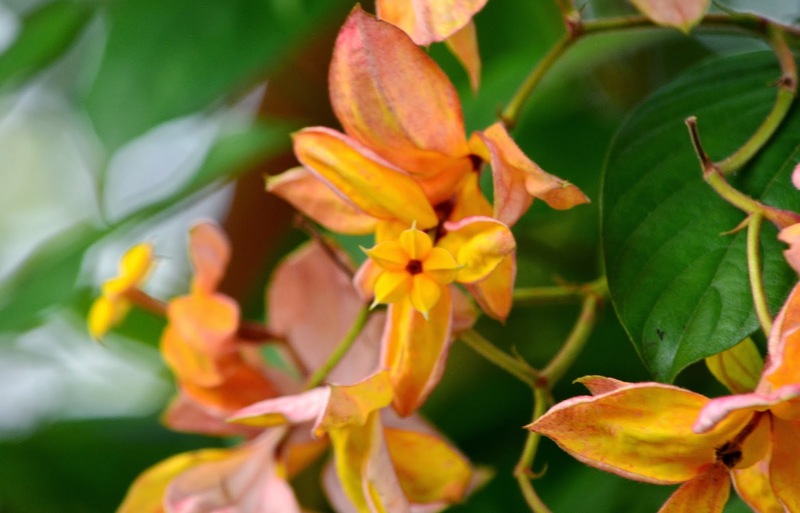 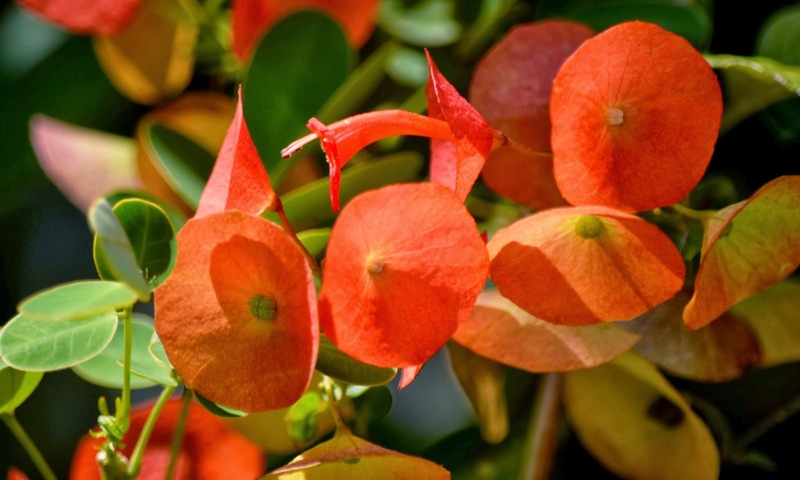 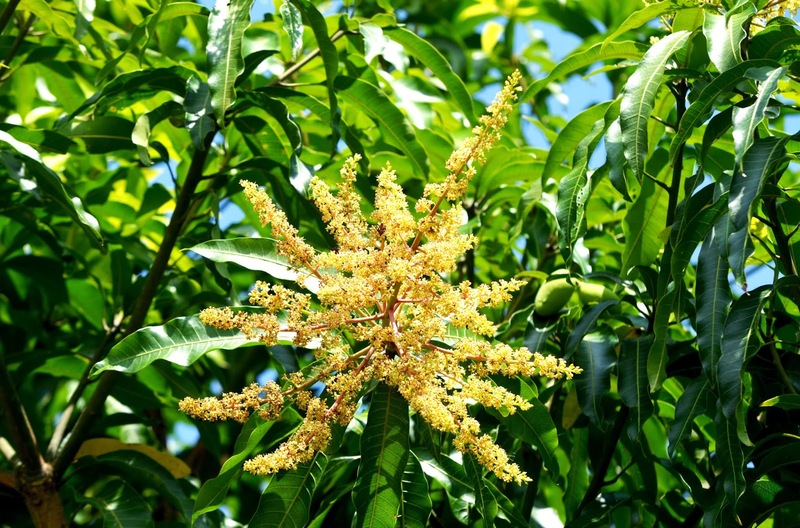 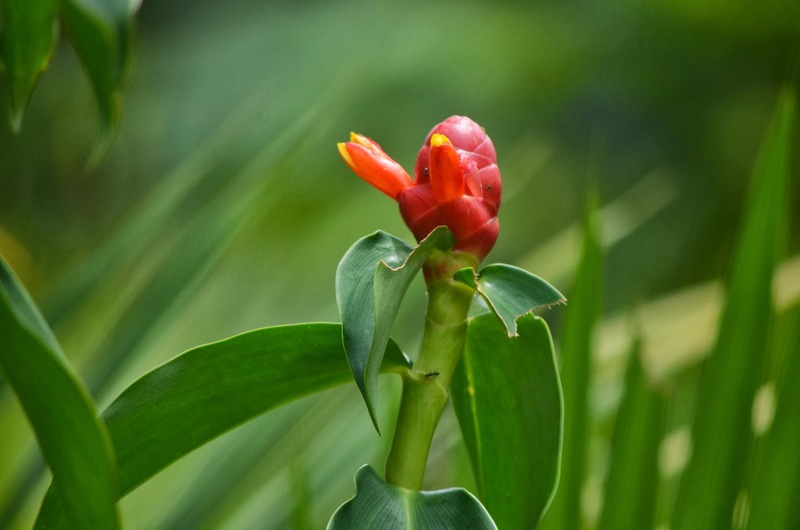 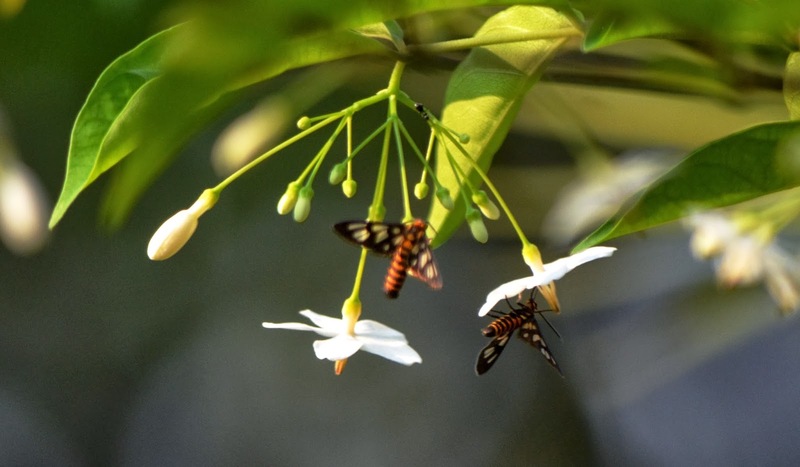 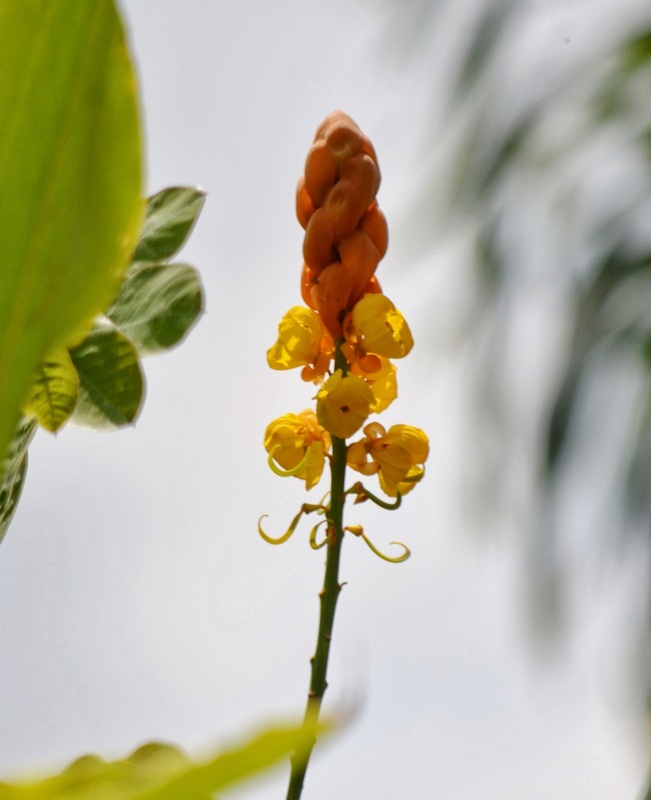 It has developed a micro-climate attracting many birds, butterflies, bees and various insects. 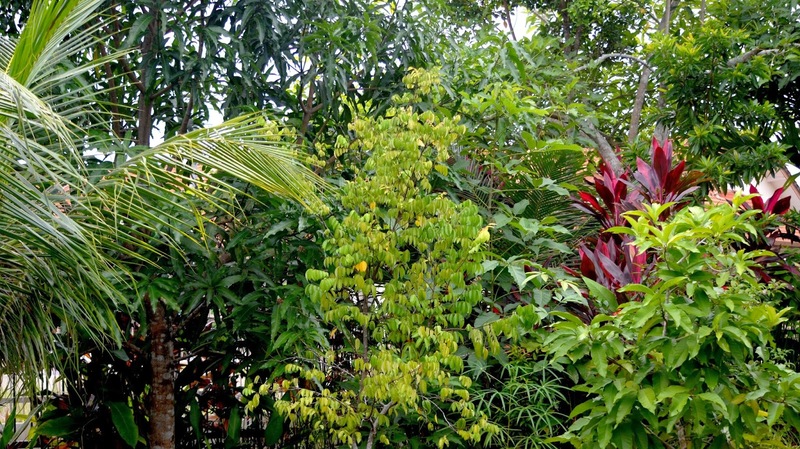 Its bio-diversity network is broadened. 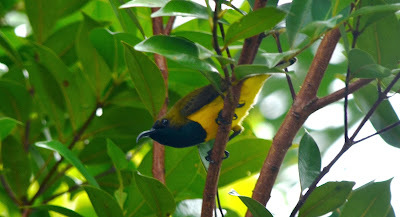 Indeed on this trip I was especially pleased with the behaviours of a nesting couple of the Olive-backed sunbird of which I have blogged in previous postings. 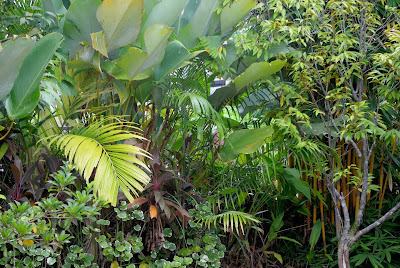 Below are some pictures of the back and side garden. 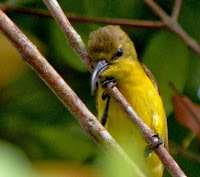 I have included the Perling bird which I saw this afternoon having a rest on the Tabebeuia rosea branch. 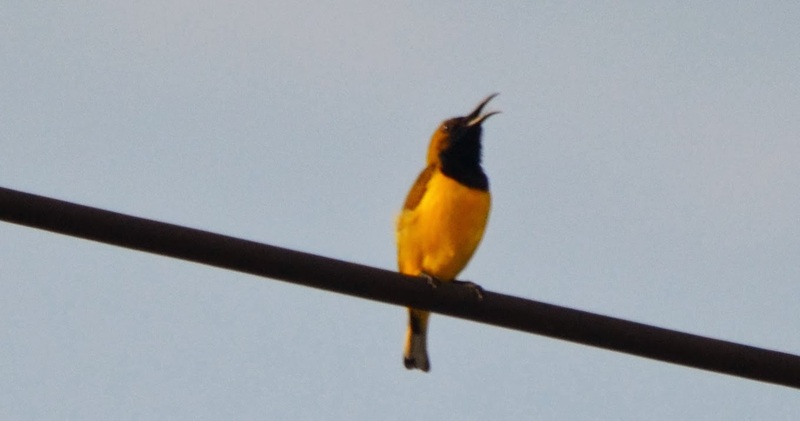 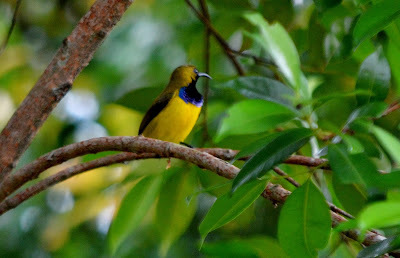 The male sunbird had a watching brief over the nest area. 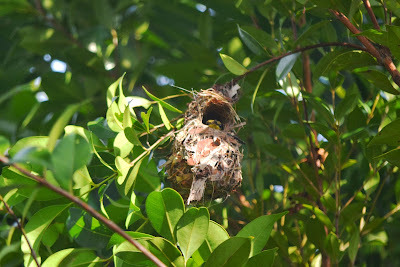 It gave out repeated calls to the female and soon after the female bird appeared with a mouthful of feathers to the nest. It rested on a branch close by before attempting to make a direct approach to the nest. She carefully placed the feathers in the nest. It seemed to me that the feathers would made good bedding material. 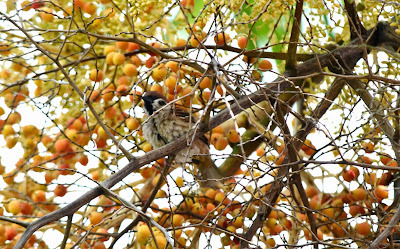 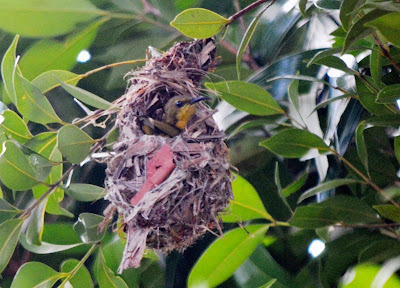 After she placed the feathers she rested on a branch outside the nest to swipe her beak on the twig and then had a little rest from a busy afternoon schedule (see picture at the inset left). 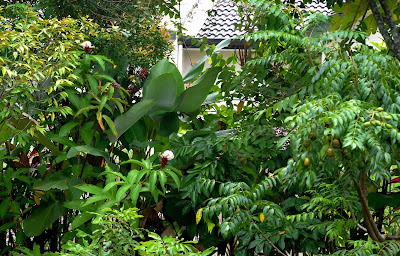 View of front garden...from outside the fence, looking north. Planting of Eugenia oleina trees and yellow bamboo at back garden, corner side..looking south. 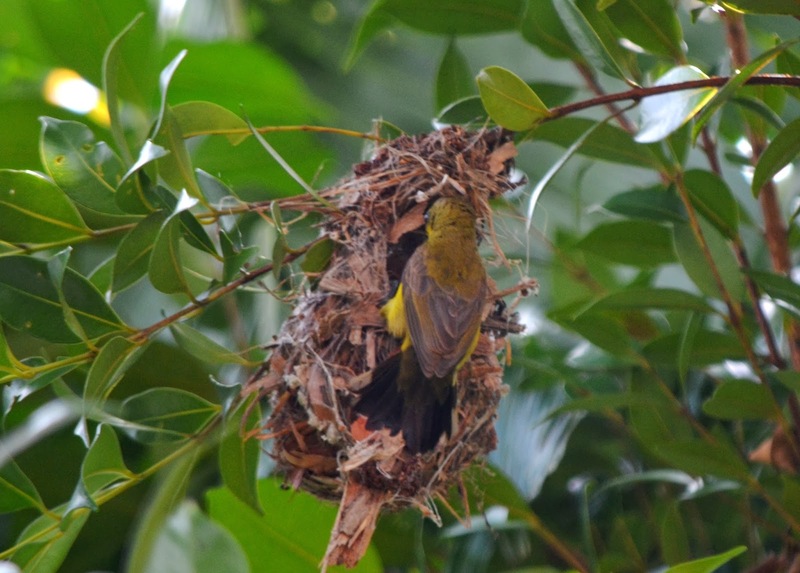 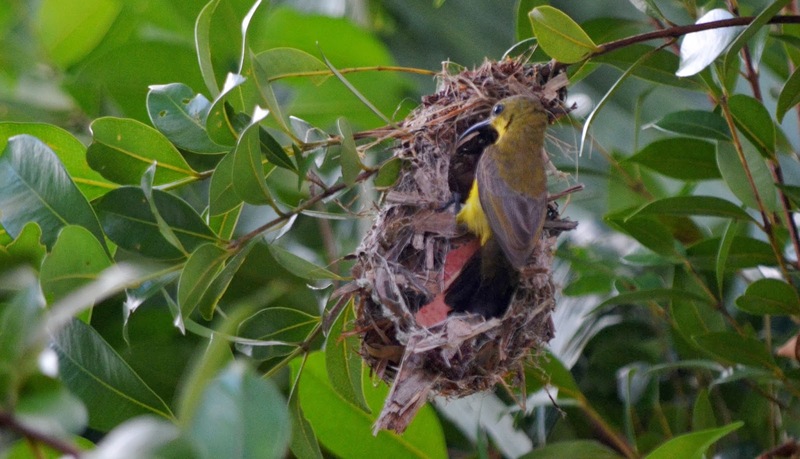 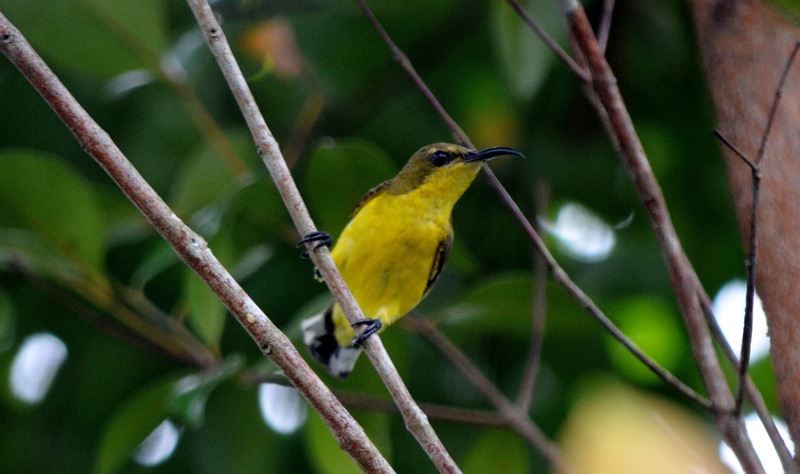 On this trip to Kuching, we are fortunate to have the chance to see the Olive-backed Sunbird darting to and fro in the garden in its attempt to perfect its nest. 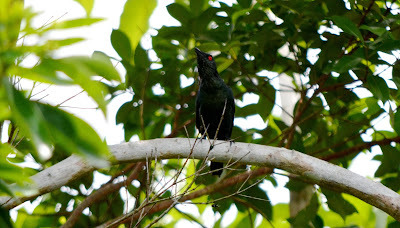 I could see the male watching her from a vantage point in the garden. 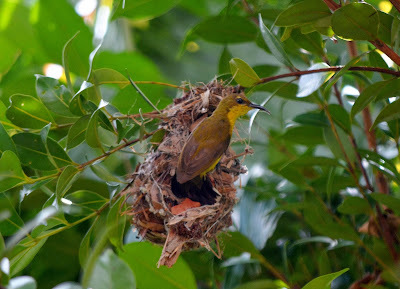 It is the female that is busy bringing in the finer material to do the finishing touches. I discovered that the nest is hung from a small branch of the Eugenia oleina tree which is planted at the back portion of the garden. 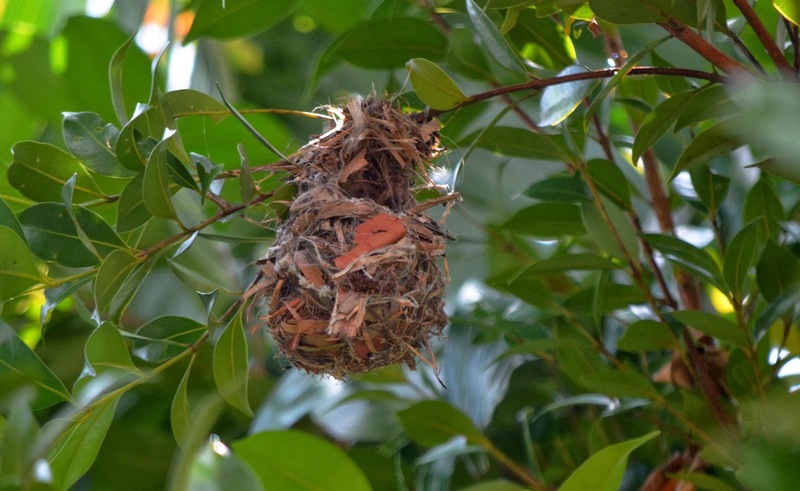 The nest is flask-shaped and is composed of twigs and glass blades. 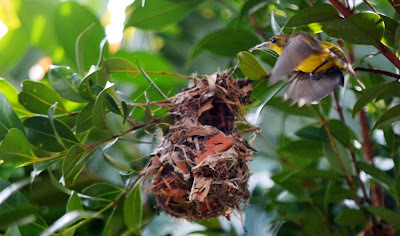 Below are pictures taken today of the female bird in flight, inside the nest and hovering just outside it too. 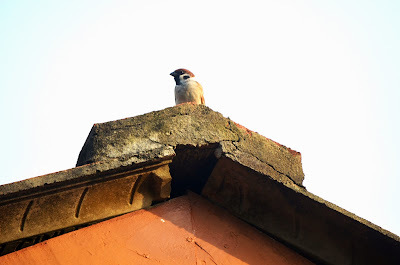 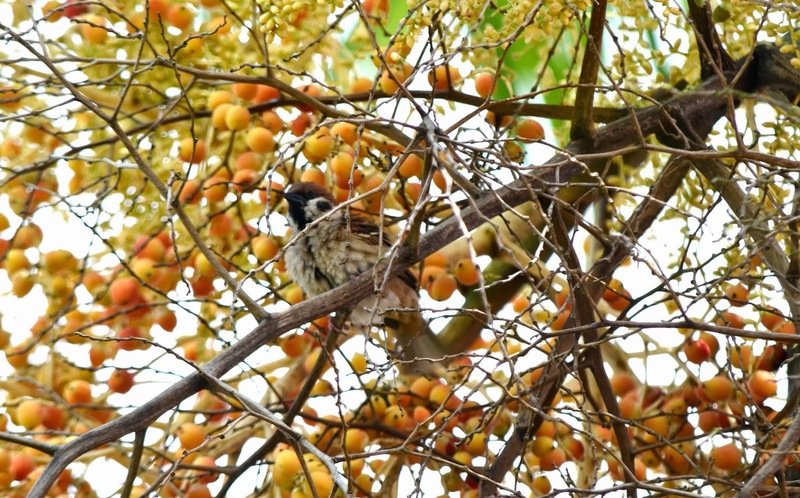 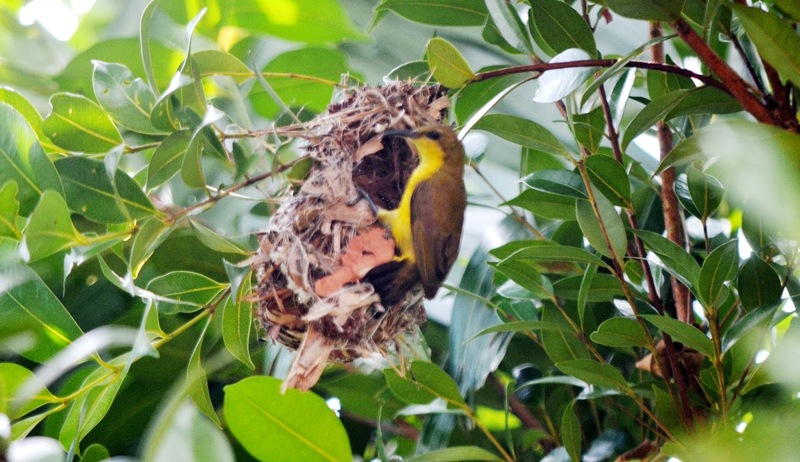 With the presence of the nesting behaviour it shows that the garden is attractive and comfortable to the birds. 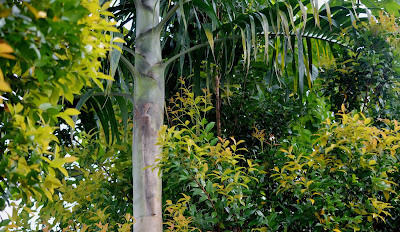 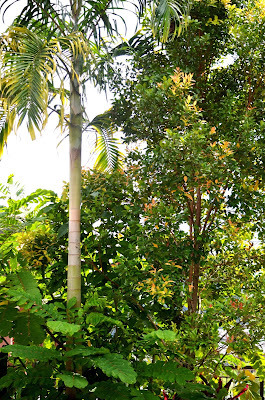 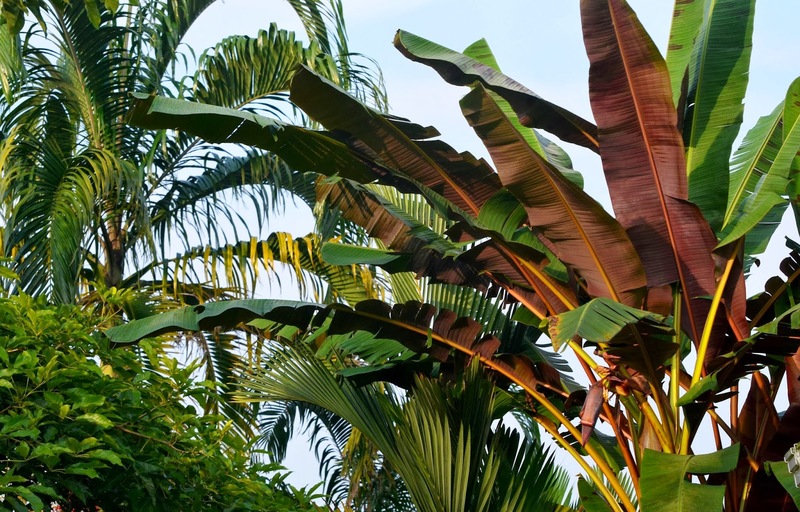 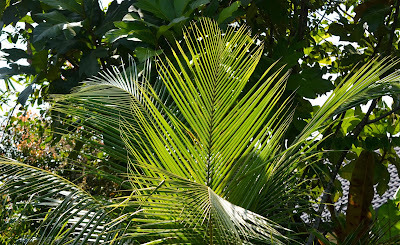 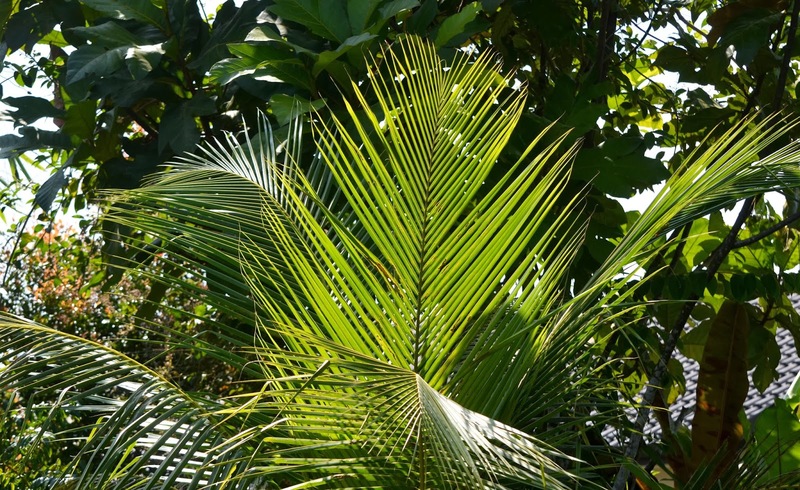 The Eugenia oleina tree is just next to the tall Carpentaria palm. Presently the oleina tree is in flushing stage, giving out a range of beautiful young leaves in colours of yellow, orange to red.